Find your next course - then use the hole maps so you won't get lost. Track your scores and chart your improvement. Measure your throws. 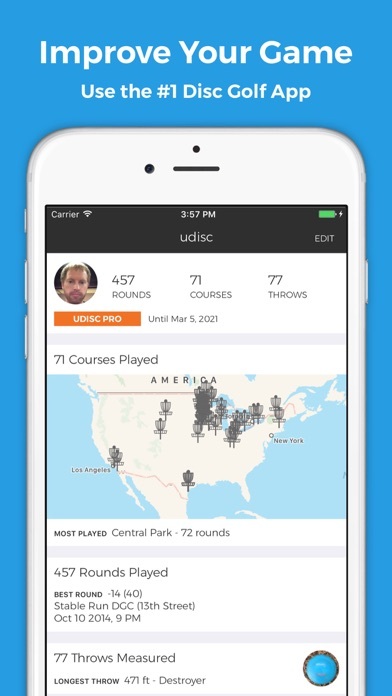 Join hundreds of thousands of Disc Golfers using UDisc to improve their game. 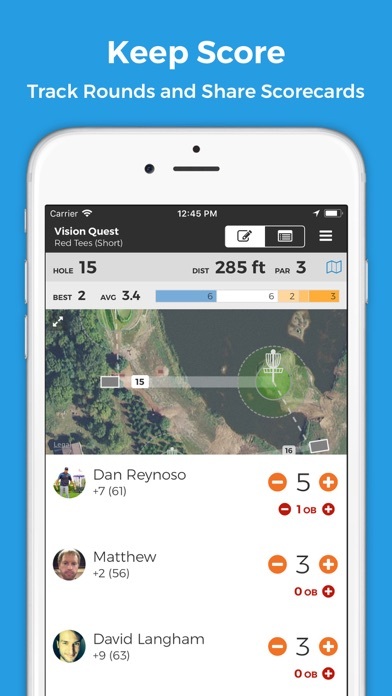 Try all the features of the #1 Disc golf app for free. The course directory, ratings, and hole maps are always free. You can also create up to ten scorecards and try UDisc Pro for a month. 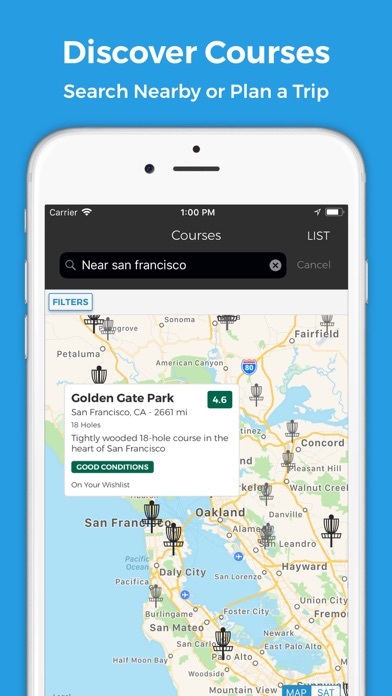 Discover Courses - 9000+ courses world wide - 100k Hole maps created by our users and only available in UDisc - Instant searching for courses nearby or near any location - Up to date course conditions - Course reviews - Sort courses by distance or by rating - Filter to find dog friendly, cart friendly, or courses with bathrooms - Multiple layouts per course (long tees, short tees, etc) - Driving directions and contact information for courses - Add courses to your wish list and track where you’ve played Keep Score - Track scores only or use the advanced mode to see stats - View hole maps and real time distance to the basket - Hear tee order announcements at every hole - Configure custom par values - Create custom scorecards for backyard games - View weather and steps data for every round - Share your completed rounds via email or social media - Enter score from your Apple Watch Track Stats - Analyze your putting, driving, greens in regulation and more - View hole averages and best scores while you play - Accurately measure your throws and view statistics - Catalog and sort your discs and link to throws - Track steps and distance walked for all rounds - Review comprehensive statistics and charts Upgrade to UDisc Pro to Unlock Even More - Create unlimited scorecards - Automatically share scorecards with all players - Backup all your data to UDisc Cloud - Participate in global and friend leaderboards - Free one month trial included Find us on social media - @udiscapp UDisc is actively developed, constantly improving, and has a very active community. Please reach out to us on social media or inside the app with any feedback, questions, or feature requests. Please add a lost disc tracking feature. 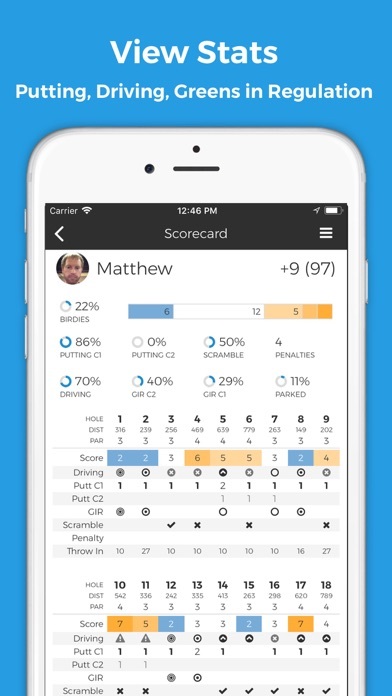 Also group local scorecards so multiple people can track the scores on their own device. 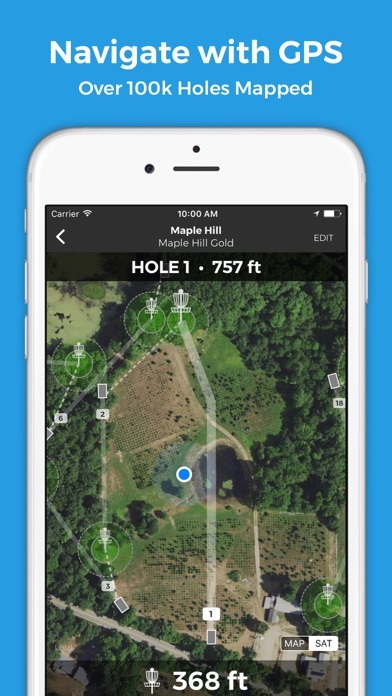 A must have app for disc golfers! I’ve been using the app for almost 3 years and it keeps getting better and better with every update. Try it out! You won’t be disappointed. This app is awesome. Decided to by the pro version to support one of the only legit apps that seem to care about contributing to the sport. They have an active presence on Reddit and seem to take criticism and recommendations well. This app is as useful as having discs to play with. Worth the $ in every way capacity. If you disc golf you need this app. Upgrade to pro and this app is awesome. This is truly the most incredible app that I’ve used in any subject or area. I wish all apps were this easy to get around in and intuitive. I think UDisc is the absolute BEST disc golf app out there! I wouldn’t be surprised if they continue to be the #1 disc golf app either! You can literally do anything on it. 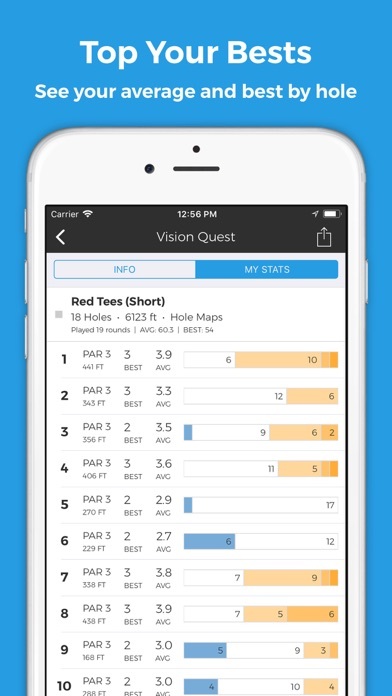 Search courses, measure throws, organize your bag, sync your scorecards with your buddy’s scorecard while you’re playing a round. AMAZING! I have use this since Udisc was in beta! Ended up chatting with the Developer Once, Great guy that really cares about the sport and his clients. Also the best way to find a course whether you’re local Or visit in an area. Great scorekeeping and the fact they give you course maps! 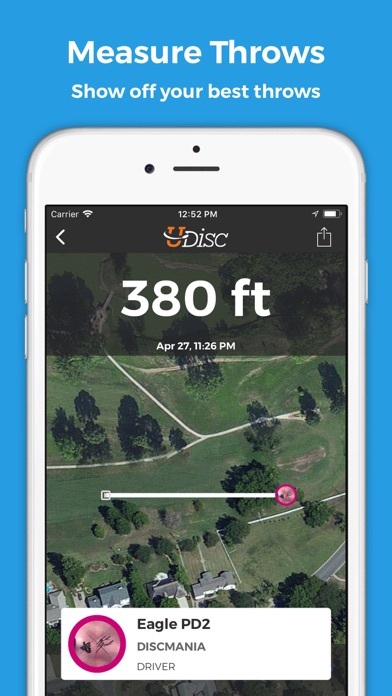 !, distance Thrown, way to keep track of your discs, And to compare scores with friends and keep track of your scores at the course. This is the best app for any disc golfer. Also the annual cost is ridiculously cheap!